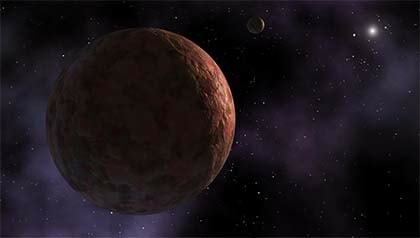 Sedna, a novice planet found in the end of 2003! Probably, some folks are unaware of the fact that on 14 November 2003, the scholars have found a novel planet and have called it Sedna. Nevertheless, the world learned about that only on 15 March 2004. Its name means the Inuit princess of the sea. It is called partly a planet and partly asteroid. It has got a number - 2003VB12. It has a reddish outlook and is similar to Mars. It is located in an empty space and thus, it became the brightest body amongst all known. Its size is even smaller than Pluto's. This diminutive body has 1,770 km. Its distance to the Sun is for three times greater than the distance of Pluto. It has an elliptical form. The period of full orbit turning is round 10,500 years. It is the internal limit of the Oort's cloud, which dimension is nearly as the diameter of Pluto. A lot of astrologists consider this heavenly body as the tenth planet, though it is far out of our system. Undoubtedly, they have started giving it many thoughts on how it influences our lives. It is referred to a planet and such conclusion makes out of it the 11th body in the Zodiac system. Right now, it stands together with all the luminaries, asteroids and other smaller bodies. It is a part of our fortune and faith and has some influence upon our lives in general. Nevertheless, it has greater importance than some other long-known bodies. Still, all its manifestations and properties are not known and they are discussed in the circles of the most outstanding astrologers. There exist multiple versions and theories and each must be studied carefully and requires time.